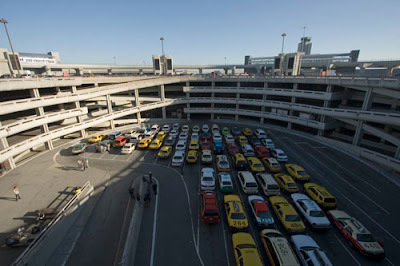 SF Taxi Media: Commentary on Barry Korengold's GPS Short Proposal. By John Han. Commentary on Barry Korengold's GPS Short Proposal. By John Han. Barry Korengold may be onto something. He’s president of the San Francisco Cab Drivers’ Association (SFCDA). And he’s proposed to save SFO’s short line with a distance based short instead of the traditional one based by time… one that would be monitored by GPS technology. Ed Healy’s got his ideas posted on “The Phantom Cab Driver Phites Back”. I posted previously about using a short system also based on distance, but one in which the starters hand out tickets to the drivers manually, once it would be determined they’d be going to pre-designated short cities. Other drivers, like Mark Gruberg, are also promoting a distance-based system using tickets that’s similar to one being used in New York. But these ticket systems are being proposed, because there was the notion that a GPS plan would be too far away into the future, and that a distance, ticket system would have to serve in the interim years. Barry says he’s talked to a CEO at a tech company that says a GPS system could have already been nearly implemented by now. If that’s true, then the GPS plan is the way to go. No need for a ticket plan in the interim. SFCDA is pushing for this plan as a pilot program until the glitches can be worked out, and then have it serve as a “complete and real time GPS system” once it’s perfected. If it can happen sooner than later, then I say go for it now. No need for an interim plan. I don’t even play the airport. I like to pick up street fares in the City and play the radio. But that’s not to say I'll never play the airport in the future. And if I do, this GPS idea would be a relatively convenient system to have. And drivers who want to save the short line would probably do themselves a big favor to get behind and support it... now! Drivers are going to have to come up with some kind of consensus soon. If you don't, you might lose the short line altogether.